You should go back to Valley Falls and do a redo video!! They have completely redecorated the church back to it’s original colors and style. The Stations of the Cross are now painted with many colors like they use to be many years ago…it was someone’s crazy idea to paint them gold in the 70’s. I remember as I grew up in Valley Falls and my parents were not happy when they were painted gold but they would loooove it now! It is totally GORGEOUS!!!! Thanks for letting us know, Betsy! I’ll forward that info on to our production manager who runs the Holy Destinations feature. Our church recently was renovated and the inside is painted in beautiful new colors including the stations of the cross. Why did you show our church prior to the renovation? It too bad you didn’t do your homework and really did our parish a disservice. Hi Ruth, thanks for your message. We started this feature a few years ago when our photographers were available to shoot all the parishes over a summer. I will let our production manager who runs the feature know about the renovations. Thanks for your interest! Dad came here for work in the shops in 1940. 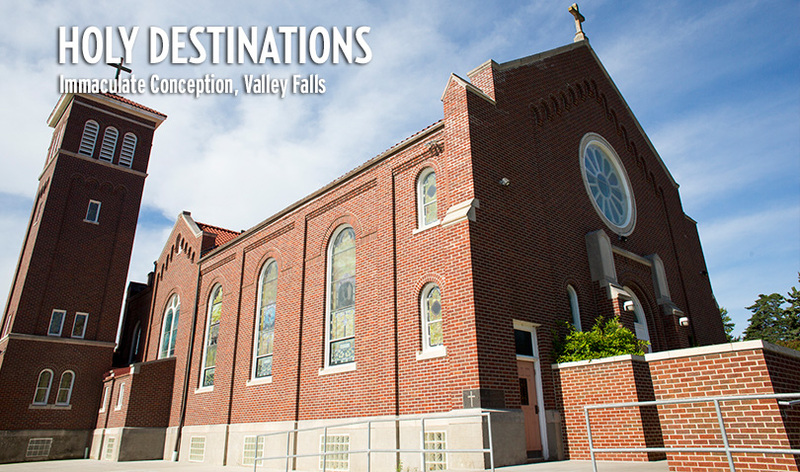 We use to come to visit our relatives at Valley Falls and Atchison and have went to Mass at Imaculate Conception. Our cousins sent us the video. Thank you! It is awesome! !